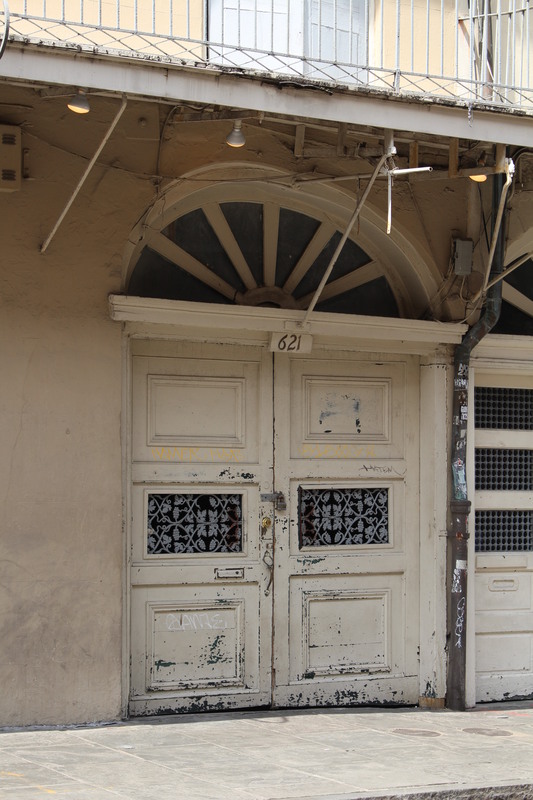 Old is what you go to see: French Quarter, New Orleans | Oh, the Places We See . . .
Leave it alone — we love it! The aging exterior of Napoleon House, New Orleans French Quarter. It’s not that we’re opposed to new. Levees need repairing. The Cabildo needs a facelift. And paint makes old spaces new again. Doors with broken slats, painted many times. It’s just that we love old. Timeworn, tattered, peeling paint old. And where else could we be more at home with the oldness than in New Orleans and the heart of the French Quarter? Preserving more than the rich heritage of jazz, the exterior of Preservation Hall shows off its ironwork and aging exterior. Take Napoleon House, for example. Occupied from 1812 to 1815 by Mayor Nicolas Girod and offered as a residence to Napoleon in 1821 while he was in exile (even though Napoleon never made it there), the home has stood solid since at least 1798 when Girod bought it at auction. And with its history and untouched spaces (well, they look untouched), it’s as much a favorite on the outside at 500 Chartres Street as it is on the inside. 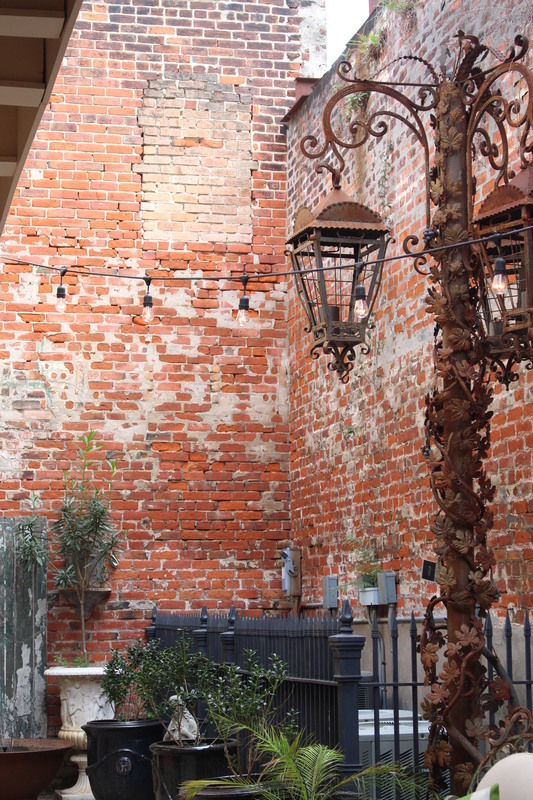 Original wall of Nicholas Girod House, now Napoleon House, on Chartres Street. But there’s more old everywhere you turn. 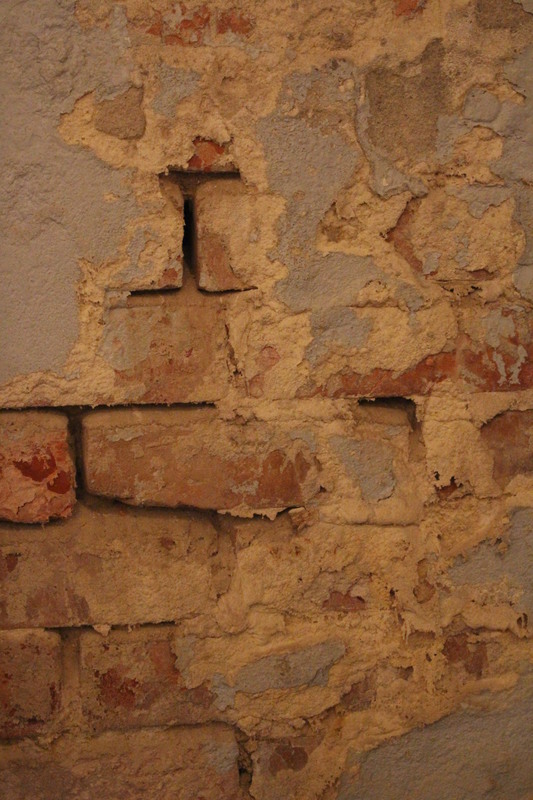 From hand-made bricks settling year after year . . .
to doors that make you wonder who went in and who came out. It’s the cute factor, too. Shotgun houses with their quirky carved adornments and colorful facades . . .
to lighting shops that use peeling plaster walls as backdrops for new merchandise. New lamps and mirrors contrast nicely with aged brick and peeling plaster walls. Sometimes it’s preservation efforts that ensure we get to see the old. And sometimes, it’s just happening upon a glimpse of a courtyard when you wonder who goes to and fro in a place as charming as this. Old courtyard with painted stairs as seen from Madame John’s Legacy. Look up to see aging, antique balconies and windows and doors. Two windows, one door open onto a stately ironwork balcony. 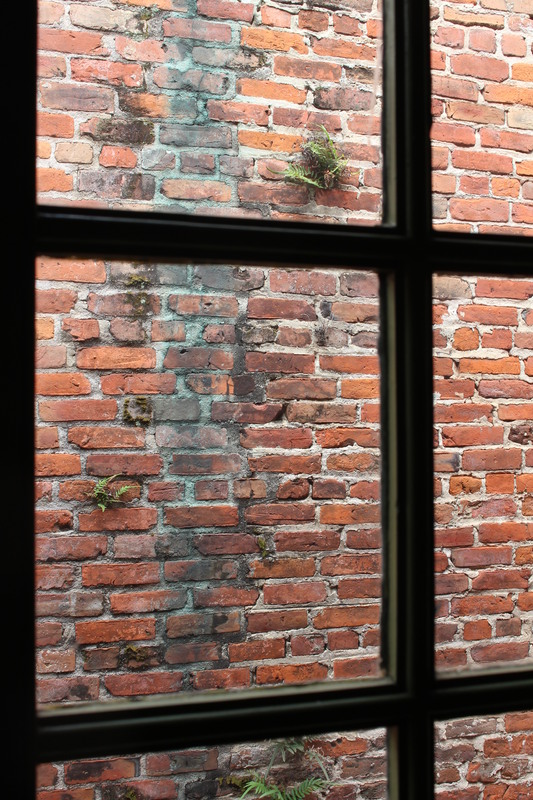 And old window ties together brick and stucco walls for a glimpse of French Quarter charm. Or look down dark corridors to see inside and out all at once. It’s old, all right. And we hope NOLA can keep it that way. ‘Cause for some of us, that’s what brings us back again and again. Thanks for joining us as we share our sights and sounds of New Orleans. 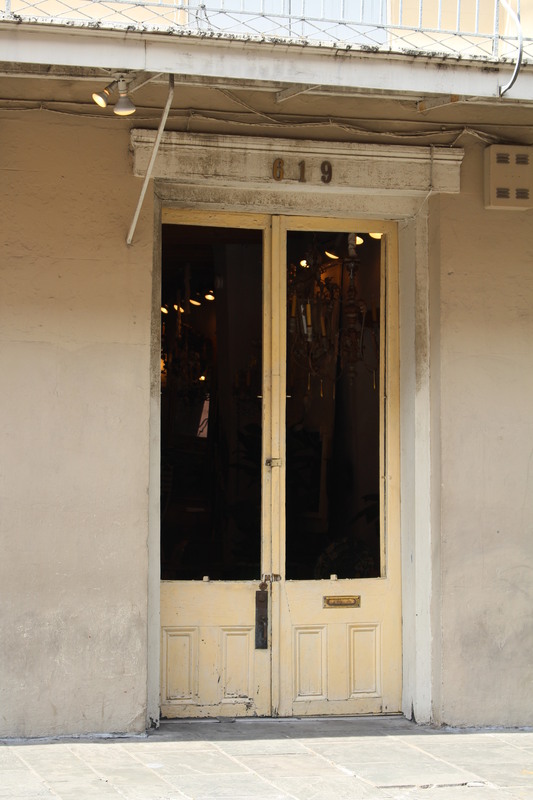 This entry was posted in Louisiana, New Orleans, Travel and tagged doors, French Quarter, Madame John's Legacy, Napoleon House, New Orleans, Preservation Hall, windows. Bookmark the permalink. In many ways, I don’t think it’s changed in 20 years — and that’s what we love about it. Of course, locals will say they’ve reconstructed, cleaned out, and painted. And they have. But they haven’t destroyed the old doors, ironwork, and paint. It’s a great place to visit. 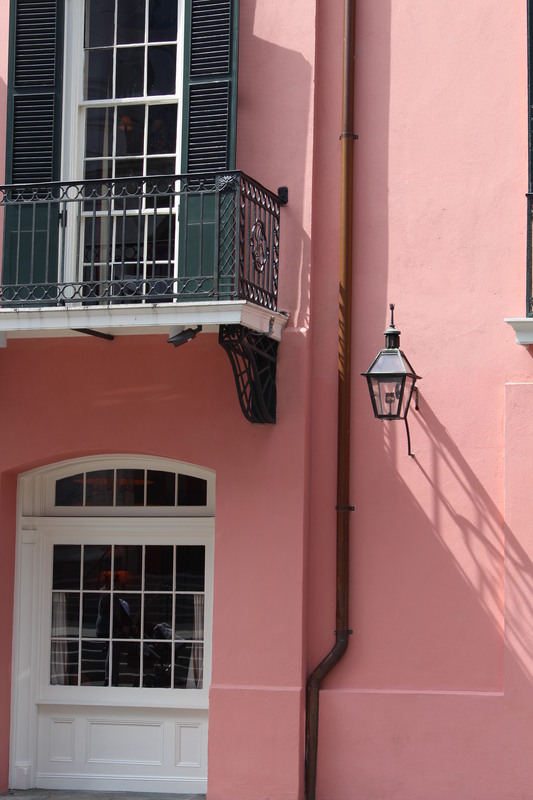 Love your pictures….they really capture the feeling of old New Orleans!! Thanks for sharing! Thanks so much for taking a look and commenting. We really love this city — food, scenery, culture, music. It’s great for a vacay! Love the old, too. Wonderful gallery and tour of NO. I’d go back right now. Although I may need to lose five pounds first just to get an even start on the trip!!! Great place to sightsee AND eat! Your friend makes good points about the condition of the French Quarter. Perhaps it’s because we’ve gone so often that we tend to overlook some of the things that a first-time visitor would see. We did see homeless people asleep in doorways and some dirty streets. But the beauty is all around in the aging buildings, the ironwork, and the lively people who work there. There are many cities with all these combined — the good and the bad — and we have to sift out what we can and cannot appreciate, I suppose. Travel opens eyes, for sure. By the way, I’m taking your suggestion to see Portland, NH. Can’t wait! beautiful photos…I was in New Orleans about 15 years ago and didn’t appreciate it then…I know I would now if I re-visited! We’ve visited many times, but find something different to appreciate each time. I’m interested in photography now more than I used to be so taking pictures was a lot of fun — so much to see there. Thanks for checking it out! I love NOLA and all of the old stuff, friendly people, fun things to do! Been there twice! And the FOOD – best ever! Mother’s restaurant – YUMMM! We love the food, too. Can’t get enough of it, but it does linger on the body!!! New Orleans is a place I have long intended to visit – but people keep telling me it’s too touristy, ‘ won’t like it….but from this post, there appear to be tons of photo ops! So I need to go, then?